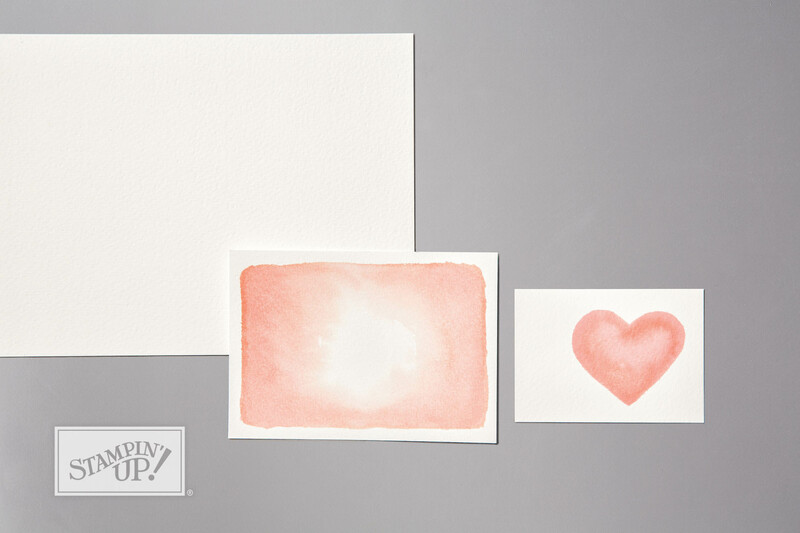 Good card stock is a most essential ingredient for successful paper craft results. It is a type of paper that adds weight (literally!) to your projects. There is greater structure, support and value in a papercraft card made from good quality cardstock. 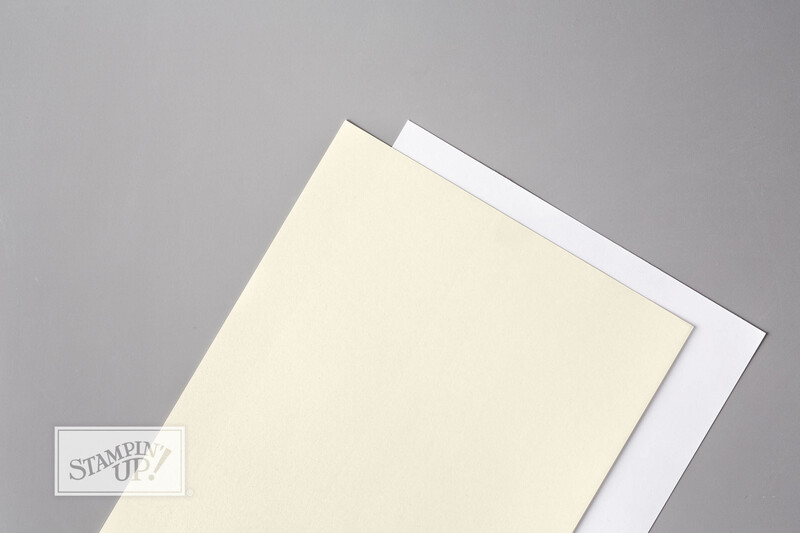 Think back to when you last received a handmade card made from copy paper, compared to one made of lightweight paperboard. They each left a different impression on you, right? Don't get me wrong. 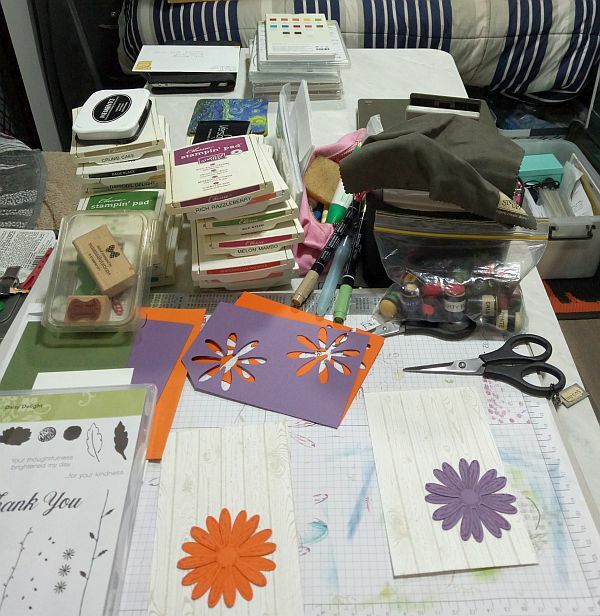 The sweetest cards are sometimes made for us out of copy paper by our children and grandchildren and I treasure those very much, but when I want to craft, I want to know I am using good quality cardstock. I choose Stampin' Up! papers for my crafting projects. It will take a score line or an embossed print. It will lend itself to techniques like tearing and distressing, unlike stationery. It is often multi-layered. Some card stock will be made of the same coloured layers, while others will have a different coloured core or a white one. It usually has a smooth texture but you can find it in textured, metallic or glossy versions. You can stamp on it with confidence and get sharp, clear images that do not bleed. What do People Make from Card Stock? 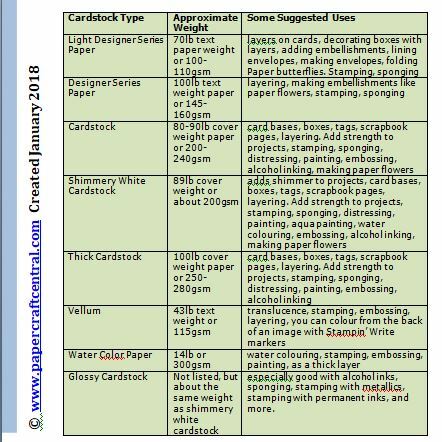 You will find cardstock used to make such things as business cards, post cards, playing cards, tags, paperback book covers, paper boxes, paper ornaments and decor, and of course, handmade cards and scrapbook pages, or even scrapbook album covers. Here are some more 3d paper projects made from cardstock. What do the Weights and Measures Mean? The Technical Stuff. You will see reams of cardstock labelled in grams or pounds, depending on where you live in the world. This means the manufacturer has weighed a square metre of card stock (like a cube of it) and found out what it weighs. This special carft material usually ranges from 135 to 300 square grams, or 50 to 110 lbs. NOTE: The higher the gsm number, the thicker and sturdier the cardstock. You may also find it measured in points or mils. This means the manufacturer has measured how thick each piece is, in thousandths of an inch. For example, you will see perhaps a 10pt card ream, which means each piece of card is 0.012" (or 0.03048mm) thick. Often 250lbsgsm card stock means each page is 10pts thick. For more information about this, look up Card Stock on Wikipedia. What About Stampin' Up! Cardstock? Stampin' Up! stocks and sells cardstock measured by the text paper weight scale. 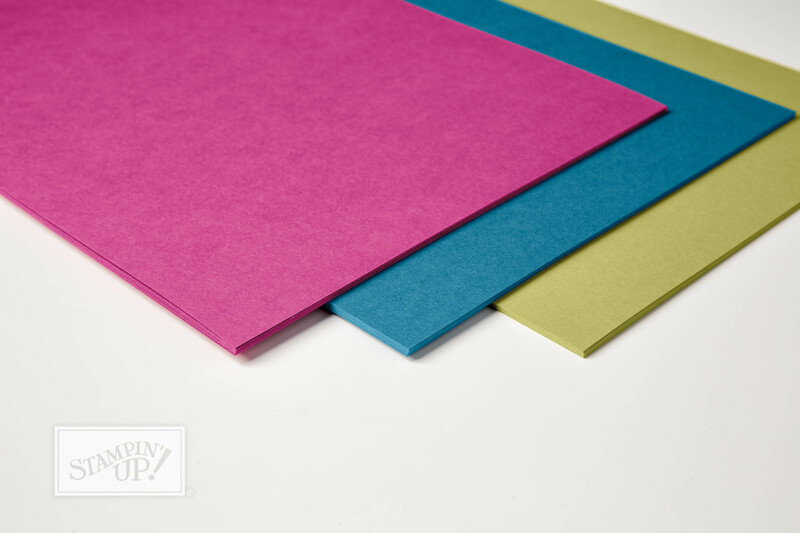 20lb bond paper is your standard copy paper, which is also known as 50lb text weight. 1. 70lb text paper weight or 100-110gsm - Lightweight Designer Series Paper (dsp). I use this for making layers on my cards, decorating boxes with layers, adding embellishments, even placing it inside envelopes to decorate them. You can also make envelopes from Lightweight dsp. Paper butterflies are great to make from this thinner dsp as it is a little easier to fold than thicker paper is. 2. 100lb text weight paper or 145-160gsm - this is your standard Designer Series Paper (dsp) and is also great for layering on your projects and making embellishments from it. I like to make some paper flowers from this type of dsp as they hold their shape better, depending on where I am going to place my flower. If it needs to be sturdier, choose 100lb text weight paper over 80lb text weight paper. The heavier the paper is, the sturdier it will be. 3. 80-90lb cover weight paper or 200-240gsm - this is the coloured or neutral, mostly plain card stock you would use to make card bases, boxes, tags, scrapbook pages and so on. You can still layer with it but it is thicker than DSP. I like to back my Christmas and other gift tags with this type of paper. It is strong enough to make good backings for scrapbook pages, too. 4. 100lb cover weight paper or 250-280gsm - this has come out from Stampin' Up! in Whisper White and Very Vanilla colours. This card stock is great for making card bases. It also makes much sturdier boxes. I always have some of this on hand, especially the Whisper White as I can just colour it any colour I want if white is not called for. I like to use it to make album covers too, even adhering two or more layers together to make the cover even sturdier. You cannot tell how thick it is from the picture, really. You need to feel it. All Stampin' Up! card stock is normally acid free and lignin free, too. 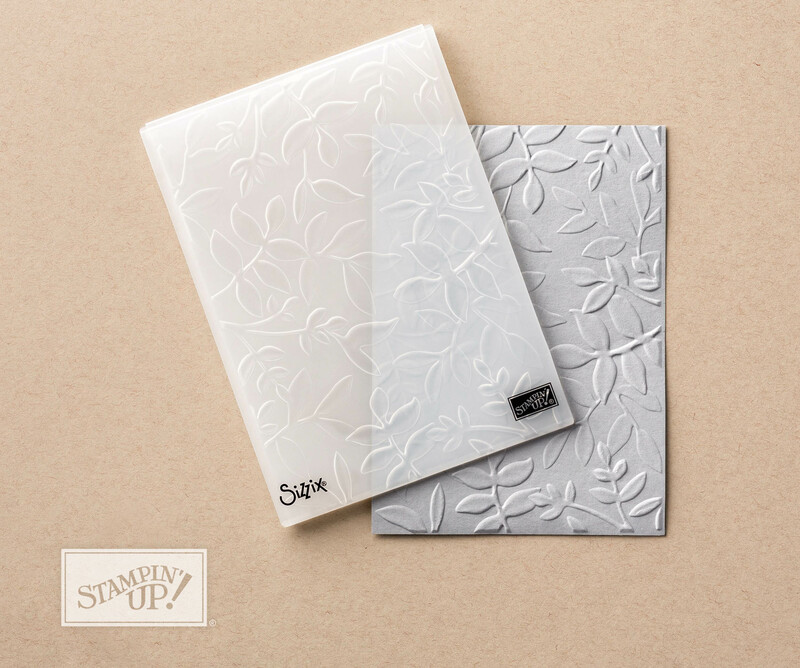 There are other specialty papers made by Stampin' Up! such as Vellum card stock (translucent), Glossy White Cardstock (not acid free) that is glossy on one side and matte finished on the other, Foil sheets, Glimmer paper and Window sheets (which are acetate). Some combine foil and acetate to make beautiful designs. Some are thicker, some are thinner, but mostly they stay around the 80-90lb (200-280gsm) cover weight. They all go through the Big Shot Machine. TIP: Sometimes with heavier embossed images or cradstock, you need to spritz your cardstock with water before cranking it through. That makes the impressions easier to take, and makes them a tiny bit more defined. I hope this has unraveled some of the mystery of cardstock weights and thicknesses for you. Now you know more about cardstock, but maybe you have further questions? You can always Contact Me if you do and I will see if I know the answer. Lol!